You probably don't think too much about your teeth and gums throughout the day, until you're in front of the mirror brushing and flossing. Even then, you may just go through the routine and get on with your day. If you have pain in your teeth or gums, you most likely take a pain reliever and deal with it, unless the pain becomes severe. The truth is, however, that even minor aches in your teeth and gums can greatly affect your quality of life. The roots of your teeth contain nerves. Both your gums and the enamel of your teeth protect those nerves. However, you may experience an oral issue that exposes the nerves to outside forces. Gum recession exposes the roots themselves. Deep decay or worn enamel from grinding can expose dentin, which houses hollow channels that lead to the roots. Foods and beverages that are either very hot or very cold can then come in contact with the roots and nerves, leading to pain every time you eat or drink. This sensitivity can make meal time miserable. Tooth decay happens as the result of acids produced by bacteria. When you ignore brushing and flossing, oral bacteria are left to enjoy lingering sugars and other food particles on your teeth. As they eat, they produce harmful acids that destroy the protective enamel of your teeth. Cavities form, creating hiding spaces for more bacteria. The bacteria can destroy into the dentin, leading to sensitivity and infections in the teeth, which causes severe pain. Infections in your teeth can even spill into your blood stream and travel throughout your body. The bacteria that destroy your teeth, also attack your gums. While the early stages of gum disease are easily reversed, more advanced stages are more difficult. Bacteria fall below the gum line, causing gum recession and attacking the roots of your teeth as well as your jawbone. Gum disease can eventually lead to tooth loss, which then makes it very difficult to eat (which affects your nutrition) and speak. 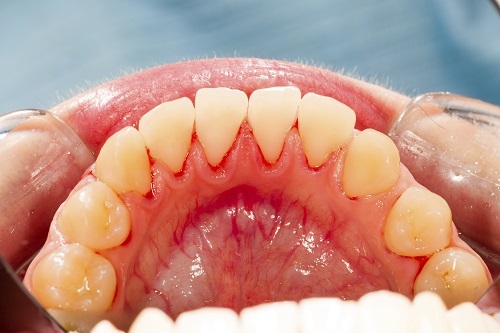 Pain in your teeth and gums, no matter how minor it may seem, is not normal. If you are experiencing any level of pain in your mouth, be sure to contact our office.